INSPIRED BY ALL THE BUZZ, WE'VE MADE A PLACE TO GATHER. 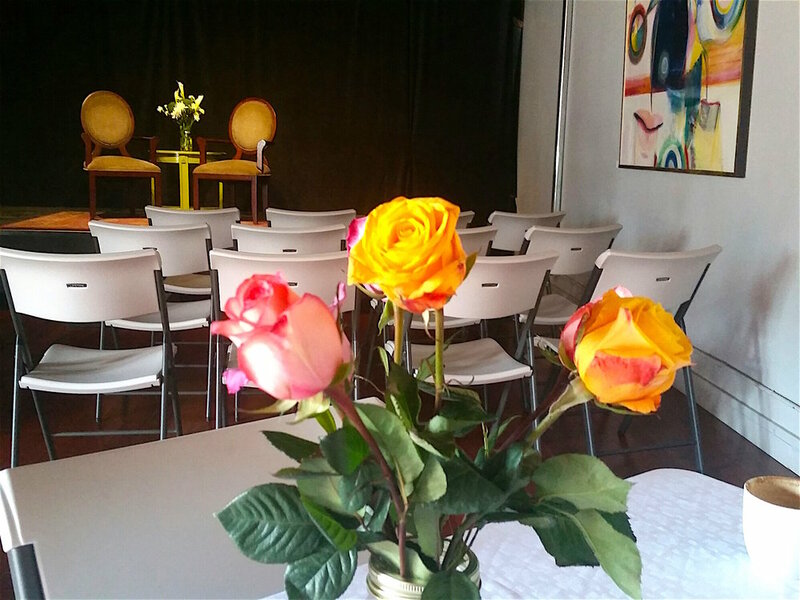 So much more than the coffee shop you love — we're pleased to offer a beautiful venue to gather in historic Lafayette, CO. Restored with modern style, the venue features gleaming hardwood floors, high ceilings and elegant chandeliers. Doors open to an outdoor patio when the weather allows. The 800 square foot space accommodates privately hosted events or those wanting to take full advantage of the coffee bar amenities. Make your next celebration or event especially memorable surrounded by the historic charm of The Hive at East Simpson. The venue's furnishings include tables, chairs and two bar areas, and the space is flexible to be able accommodate various arrangements. If you'd like to host catering for your event, we are happy to allow you to select your outside catering preference. If you'd like some recommendations for your needs, we're happy to suggest options. If you're planning to serve beer and/or wine, we are pleased to order that for you. Hosting a performance? We have a moveable, custom-built stage and lighting for you. 7 AM – 5 PM daily. We love to accommodate the space to your specific occasion, occupancy and duration needs. Contact us to discuss your event and we'll put together the perfect package and rate for you. What makes The Hive different than any other venue? Located at East Simpson, the venue features a striking balance of modernity and historic charm on what was formerly the main street of Lafayette. Renovated with hardwood floors, modern chandeliers and high ceilings, the space maintains the comfort of the coffee shop but invites a level of sophistication for your events. You’re welcome to visit and view The Hive during regular cafe hours. What is required to secure the venue? A signed agreement with a valid credit card number. The venue space can accommodate up to 60 guests. The cafe offers light fare, coffee, beer and wine for purchase. We have a food prep area that your favorite caterer may use to serve your event. Do you provide food & beverage service? Yes. All vendors must just be pre-approved. The only items we require you to purchase through The Hive are beer and wine. Live music is also permitted as long as all equipment is pre-approved. We have a limited amount of spaces that are convenient for loading and delivering items you may be bringing, and public parking is available on the street . When can I view the venue?